We are a local voluntary group, formed in May 2003 to support Harrow Council’s bid for Heritage Lottery funding to restore Canons Park to its former glory. The bid was successful and by 2007 the work was completed, creating better pathways, repairing park buildings of historic interest, planting and maintaining trees and shrubs and restoring the beautiful George V walled Memorial Garden at the heart of the park. As a result, Canons Park now feels much safer and there is so much more for visitors to do and see! ● Campaigning for the installation of an adventure playground, where we have since donated a kiddies’ slide. ● Creating the Good Friends Café, which is open from spring to autumn, weather permitting. ● Organising litter picks at least three times a year, to keep the park clean and feeling safe for visitors. ● Hosting volunteer ‘Gardening in the Park’ sessions, where individuals and corporate groups help by planting bulbs and shrubs, weeding flower beds and tidying up woodland walks and other overgrown areas. ● Holding various annual events such as the highly popular Canons Park Kids' Funfair Day. ● Taking part in the London-wide Open House Day each September. ● Successfully lobbying for the installation of a path and disabled parking bays at the top end of Canons Drive. ● Creating a Woodland Walk at the north end of the park. ● Donating bulbs and shrubs for planting in various sites to improve the landscape. ● Researching and building up an archive to illustrate the history and archaeology of the Park and the original Canons Estate. ● Holding regular bird-watching walks. Look out for news and future dates for all Friends events in the park on our notice board at the Bothy, next to the Good Friends Café (see map) and on park entrance gates. Would you like to join us as a steering committee member and help plan new and exciting projects and events for the park? We are also looking for volunteers to help out on event days and gardening sessions. You can also support the work of the Friends by becoming a member – it’s only £5 per year, per household, and you’ll receive a newsletter three times a year with all the latest news and information on forthcoming events…why not contact us to find out more or print, fill in and post the membership form below? There is an annual subscription of £5, for which you will receive a quarterly newsletter. 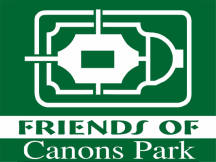 Please enclose a cheque made out to "Friends of Canons Park". Please help us to save postage costs by electing to receive your newsletter by email. We will also keep you up to date on forthcoming events in the park. We will not share your details with any other member, group or organisation.